You've heard of Silicon Valley's tentacles reaching across the world. Now it seems the world is reaching back. Take the example of Gangnam, a district in southern Seoul, South Korea. This enclave, which literally means "south of the [Han] river," is home to D.CAMP, a 30,000 square-foot entrepreneurship center aimed at startup founders and investors, as well as tech developers and designers. The Banks Foundation for Young Entrepreneurs, a group of 20 local banks, is supporting this new collaborative workspace, as well as providing financing, mentorship and business education to entrepreneurs. D.CAMP, a 30,000 square-foot entrepreneurship center, is part of a project to transform the Gangnam district of Seoul, South Korea, into a sort of Silicon Valley-like innovation hub. Each bank has committed between $10 million and $20 million to assist Koreans in their 20s and 30s who have started ventures in the last three years. "Startups are more effective at creating jobs, so a lot of people think the Korean future is dependent on startups," says Hahn Ryu, D.CAMP'S program coordinator. Expand your paying client base. Flitto has been around for less than one year, though the translation platform already boasts more than 1.3 million users across 150 countries. Its digital program, which provides free, real-time translations for mobile or online content, has included users such as Paulo Coelho, the Brazilian author of The Alchemist, whose tweets sometimes read, "translated by Flitto." Simon Lee is the founder and CEO of Flitto, a digital translation platform that is based in Gangnam. His face is concealed by a mask of Psy, the singer behind "Gangnam Style." How does the venture make ends meet? Simon Lee, founder and CEO, sells Flitto's database -- where nearly 300,000 translations are made daily -- to bigger companies that produce machine translations of their own. "Those companies are doing word-by-word translations, which are not always correct," Lee says. He also is generating revenue from other businesses, including music labels whose artists want to tweet in different languages to their fans, and daily-deal sites like Groupon whose English-reading customers want local deals translated when they visit other countries. "Every company or service wants to reach out globally," says Lee, whose business takes about 6 percent of the revenue its partners generate through Flitto's translation services. He declined to disclose Flitto's financial results. Customize your product, then your marketing message. Edward Lee, head of overseas development at VCNC, a mobile-app maker launched in 2011, hopes to boost the number of foreign downloads of Between , a free app that lets two people -- such as siblings, buddies or lovers -- chat or share photos on a virtual-memo board through a smartphone. To succeed, he plans to customize both the product and the marketing to suit people in other countries. Jaeuk Park oversees VCNC, the venture that produces apps. The company's most famous program, Between, has been downloaded more than 2.8 million times-thanks, in part, to an endorsement by a famous Korean pop singer. Between has been downloaded more than 2.8 million times, with 70 percent stemming from inside South Korea. The app became a hit without much advertising. Instead, the business plugged Between by planting the South Korean symbol for "commitment" into local blogs and virtual communities. A big coup came last Valentine's Day when Block B, a Korean pop singer, released a song that referred to the app. VCNC declined to disclose any financial results, but the company has reportedly raised roughly $4 million in venture funding. Before the company decides on a promotion campaign for the U.S. market, it is revamping the app to focus more on fostering "serious relationships," Lee says. One difference: American users want features that are less "cutesy" and more functional, such as fewer emoticons and more ways to reach a loved one. Showcase products at events to find new partners. Many countries host high-profile industry exhibitions where startups can break out, such as Mobile World Congress in Spain and Finetech in Japan. FXGear, a visual-effects studio and digital-products maker founded in 2005, chose South by Southwest in Austin, Texas, earlier this year to showcase new wares and try to expand its roster of business partners. 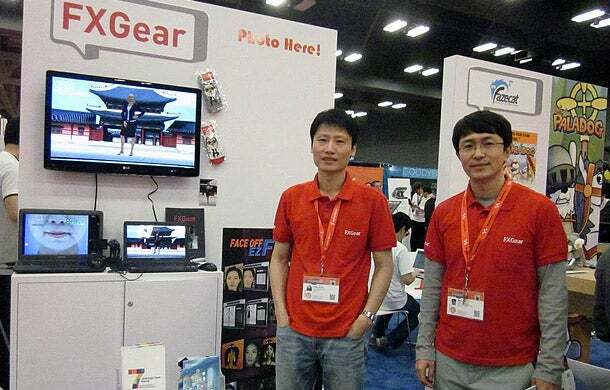 Like other startups from Gangnam, FXGear showcased its products at South by Southwest in Texas earlier this year. Tommy Ryoo, left, heads the company's sales and marketing division, which is aiming to push new visual effects technology into the United States. In Korea, FXGear has already sold its virtual apparel-fitting technology to major online retail sites, so consumers can use a 3D avatar to try on new looks. To expand into the U.S., the company used SXSW to approach hair salon chains with a new tablet-based feature that lets customers try out virtual makeup. It also has continued to market to retailers in the U.S. its more established visual-effects technology. The company, which declined to disclose financial results, says it is still looking for a business partner to help with expansion plans in the U.S. and aims to return to America to showcase other new products at events. For instance, "we have plans to develop a mirror, and if you stand in front of it, you can see your reflection and try on garments by clicking the icons in the mirror," says Tommy Ryoo, FXGear's sales and marketing director. What innovative methods have you use to expand into a new market? Let us know with a comment.